I "might" have gone overboard on my tag designing. After a long creativity hiatus, I found that once I got started, I couldn't stop. 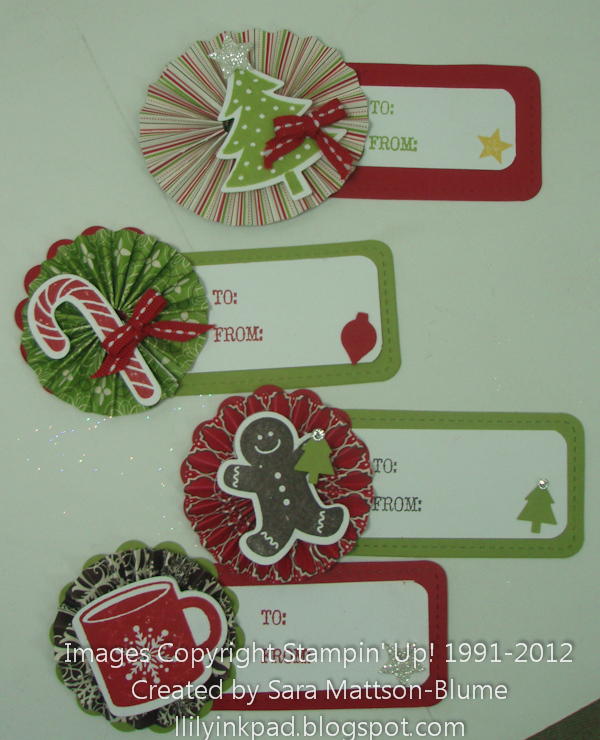 However, what seemed easy to make for me, took a lot longer than I thought it would for my stampers. Luckily, they had the patience to make it through! To make the lollie's I scored a 1" by 12" piece of Designer Series paper at 1/4" increments. I found that I sometimes messed up and that was an issue for others. I didn't have a problem. I also cut sticky pages into 1" ish squares (instead of the old way of punching circles). I found that I got many more sticky parts to adhere the lollie's to! Other than that, the tags are self-explanatory- stamp, cut out with the Big Shot framelits, adhere layers and fun accessories! Now, to find people who will appreciate the tags as much as I do.